Blizzard created a magic formula for fun with Diablo, which turned out to be one of the most addictive games ever made. It was kinda simple and repetitive, yes, but it kept millions of players hooked through a slow but steady trickle of character upgrades. A stronger sword here, a tougher armor there... hours flowed like water. But as effective as this formula is, in the wrong hands it can go awry. Case in point is Namco Bandai's Bounty Hounds, which usurps Blizzard's recipe wholesale but prepares it with all of the skill of a McDonald's fry technician. Bounty Hounds gives Diablo a 3D, sci-fi makeover. 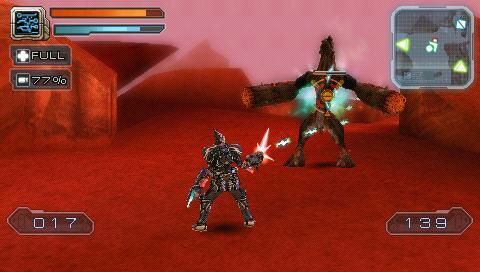 You play as Maximillian, the hard-bitten leader of an interstellar mercenary squad. Their job is to pave humanity's way for the terraforming of hostile planets, which means beaming to the surface and smacking down anything that moves. The combat action is smooth, humming along at a rapid pace even as hordes of hostile robots, aliens, and hostile alien robots descend on our lone hero. He starts out armed with incredibly powerful blades and guns which slice through the mobs like so much xenobutter. Smooth as the action is, there's not a lot to it beyond tapping the two attack buttons a lot. It's not engaging, and can't sustain hours upon hours of gameplay. So how about those Diablo-like RPG elements? Dead on arrival. Your small inventory will necessitate lots of trips back to the mothership (cue annoying load times) during the course of a mission, so you can have all the loot identified and clear space by selling off junk. The problem is, it's hard to care about your precious loot. One weapon might do 2% critical damage versus another's 1%. Diablo's little stat increases had tangible effects, which was the secret to its addiction. Not so here. Since your starting weapons do hundreds of points of damage alone, none of the possible upgrades are meaningful in actual gameplay. If we want to squint at pointless screens of numbers we'll play Microsoft Excel. Nearly every element of Bounty Hounds falls flat. Graphics? Utterly mediocre and heavily fogged (the comic-like cinematics are drawn nicely, though.) Level design? Non-existent: expect a sleep-inducing never-ending sequence of open fog fields and blocky square corridors. Description It's Diablo in space, with aliens instead of demons and guns in place of crossbows. It's also a sleeping aid.